Man was not meant to spend all day hunched over a dimly lit screen; disturbingly high incidences of obesity, joint pain and fatigue are our bodies’ not-so-subtle ways of saying they want to get up and move around. 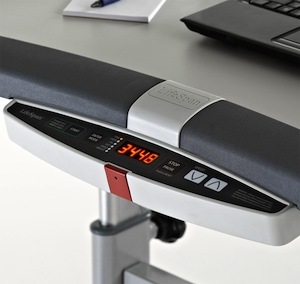 After piloting a walking desk – a standing desk attached to a treadmill – for a month, I’m convinced they should become the default workstation. Immediately, my daily calorie burn jumped 30.7 percent, and I lost 3 pounds and a percent of body fat in a week. I also experienced less joint pain throughout the day. 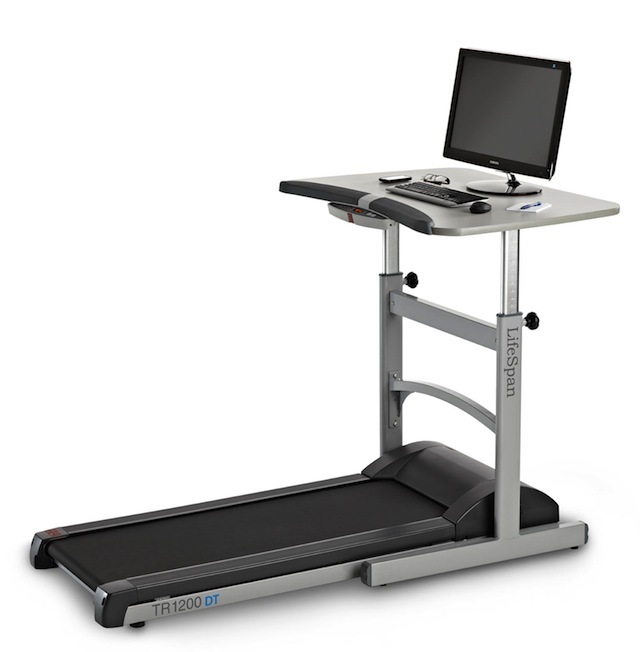 The Lifespan TR-1200-DT5 (retail: $1,500) places a square standing desk atop standard-size treadmill (74″). Instead of a large front dashboard, a relatively discrete control panel for speed is attached on the body-facing side of the desk. Speed varies from .4 MPH to 4MPH (about the pace of a light run). Migrating to the walking desk was relatively easy: I just plopped my laptop and monitor down on the squarish 46-inch desk and got to work. The intuitive interface lets you choose several tracking mechanisms for calorie burn and distance. The first day I couldn’t walk more than an hour at a time before I felt like I was losing concentration. It also takes some getting used to walking like a Tyrannosaurus rex (arms tucked-in and elbows bent at the keyboard). At first, I would work for an hour walking, and then sit for 30 minutes. The first day I walked about four hours. Now I only rest once a day. It also took a bit to develop the musculature in my upper back to support raised arms for hours on end. This is no longer a problem. After experimenting with different speeds, I now vary between .8 and 1.2, picking up speed in the late morning/early afternoon to offset the natural fatigue that precedes the morning news rush. Every so often I have to lean on my elbows or straddle the rails to take a break. While it’s intuitive to think that walking for an extra 5 to 8 hours a day would burn more calories, recent scientific evidence suggested otherwise. A study of “exergames” – video games that require full-body movement – found “no evidence that children receiving the active video games were more active in general, or at any time, than children receiving the inactive video games,” concluded the research published in Pediatrics. “When you prescribe increased physical activity, overall activity remains the same because the subjects compensate by reducing other physical activities during the day,” explained author Anthony Barnett to The New York Times. So, if I was walking part of the day, would I end up being lazier throughout? Getting up fewer times to grab a glass of water, unconsciously sitting on the subway more often, or sleeping more? No, it turns out — quite the opposite. My average daily calorie expenditure jumped 30.7% (2606 vs. 3408), as measured by the BodyMedia armband, which calculates personalized calorie burn from the body’s sweat and skin temperature. The first week, I dropped 3 pounds (as expected from the 1500 calorie/day deficit) and a whole percentage of body fat (as measured by a Withings scale). Subsequently, my weight and body composition stabilized. But, that’s probably because I have the metabolism of a catatonic gerbil and can’t seem to find any diet that works. Others may have different results. Additionally, I find myself better equipped to take on San Francisco’s hills and will often walk to a meeting now if its less than 1.5 miles away. Indeed, I’m addicted to being upright. One day, when the subway broke down on my way to the gym, I just ran to class from the Mission to downtown SOMA (roughly 2.1 miles)–a surprise to me since I don’t think I’ve ever run two miles straight. The problem I face now is loathing to work sitting down. While traveling, I’ll look for coffee shops that have a window facing bar so I can at least stand during work. Walking while working has a few unintended complications. For one, sometimes my laptop microphone picks up vibrations from the treadmill and I have to explain that I am not in the middle of a construction site. Second, I eat while walking now. On occasion, I drop food crumbs, which inevitably get carried along the conveyor belt and pile up behind me. I am yet to find a tiny, oblong trash bin to catch the byproduct of my imperfect eating habits. Quirks aside, I’m definitely keeping the walking desk. Man was meant to be upright, and I want to live a long, healthy human life.